Traffic Tickets 26 Conkey Ave. There are two ways in which this office handles traffic tickets. Please click the links below for more details. 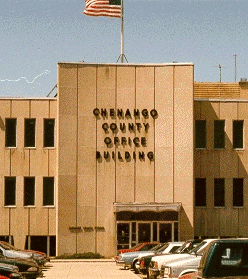 The Chenango County District Attorney has implemented a program designed to assist motorists with certain non-serious Vehicle & Traffic offenses by allowing them to participate in a traffic safety course approved by the New York State Department of Motor Vehicles, in lieu of a conviction of the traffic offense. Upon successful completion of this traffic safety course and receipt of the required application fee, the motorist's traffic ticket(s) will be dismissed. There will be no fine or surcharge and there will be no record of conviction on the motorist's driving record. This office can, in some cases, request a reduction of charges for Vehicle & Traffic Law tickets.